Product description: Go and not go gauge for bases GU10, 7006-121-1. 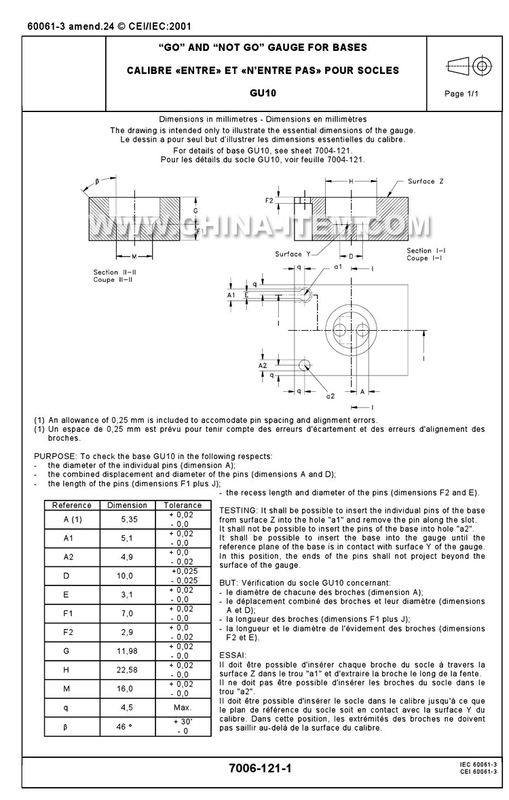 - the recess length and diameter of the pins (dimensions F2 and E). It shall be possible to insert the individual pins of the base from surface Z into the hole “a1” and remove the pin along the slot. It shall not be possible to insert the pins of the base into hole “a2”. It shall be possible to insert the base into the gauge until the reference plane of the base is in contact with surface Y of the gauge. In this position, the ends of the pins shall not project beyond the surface of the gauge.